With its superb public buildings, its lakes and gardens, Yangon was once considered as the “Garden City of the East” in the British Empire. In 1852, British took over Yangon and turned it into the capital of Lower Burma and in 1885 of all British Burma. Colonial Yangon was considered a jewel in the British Crown with the city matching even London by its public services and infrastructure at the start of the 20th century. Yangon has the largest number of colonial structures of any city in Southeast Asia, although recent modernization in the last five years has translated into the destruction of many buildings. However, they are still a lot of magnificent structures as a testimony of Yangon glamorous colonial past standing side by side with stunning pagodas and century-old teak houses showing Burmese exquisite architecture and art. In 1996, the Yangon City Development Committee created a Yangon City Heritage List with 200 old buildings and structures being protected. Yangon city centre offers lots of attractions and it takes at least two days to explore some of them. The Shwedagon Pagoda is Myanmar most sacred Buddhist pagoda. 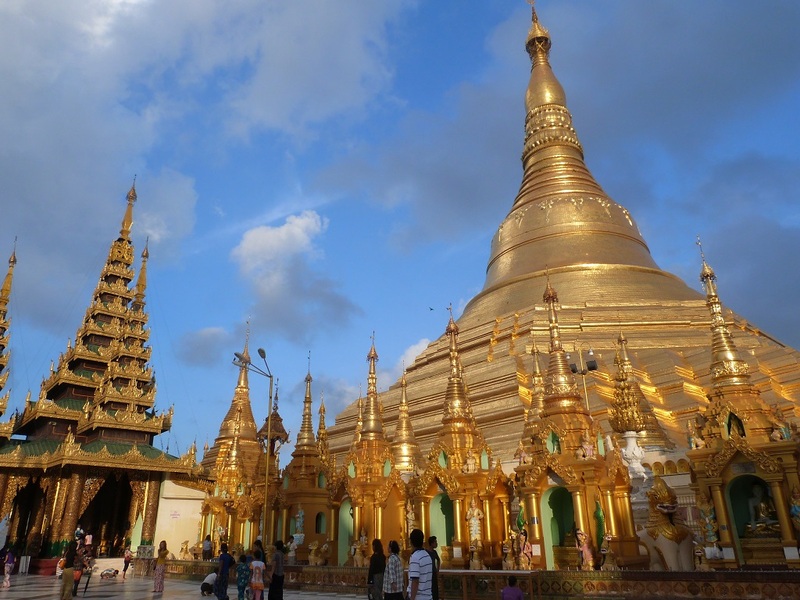 It is also known as the Great Dagon Pagoda and the Golden Pagoda. 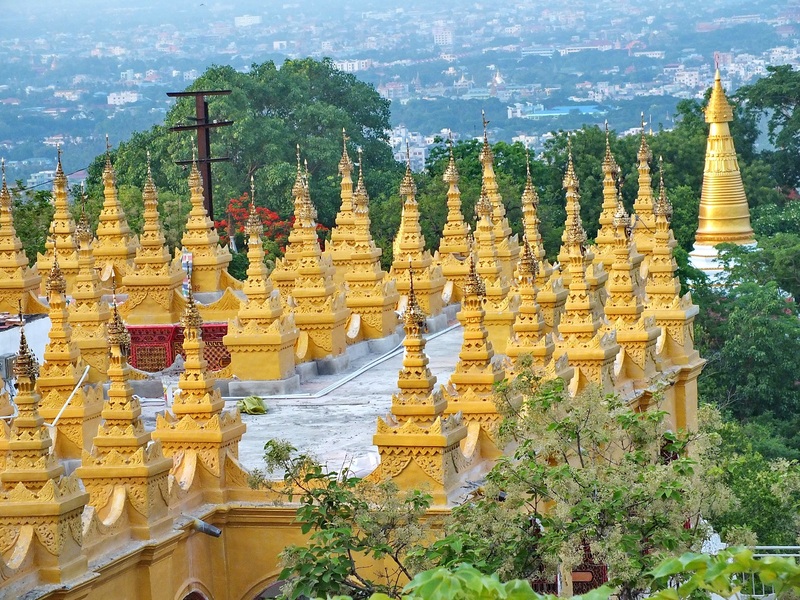 Standing on Singuttara Hill, west of Kandawgyi Lake, the pagoda is 99-meter high and is known for its giant gilded stupa surrounded by hundreds of smaller stupas, all cover in gold. The main stupa is crowned by a 76 carat diamond while the crown is tipped with 5,448 diamonds and 2,317 rubies. The pagoda was erected between the 6th and 10th centuries but rebuilt in the 18th century. The pagoda is open every day from 4am to 10pm with an entrance fee for foreign visitors. Go there: The pagoda is located 4 km north from the city centre with a possibility to go by taxis. 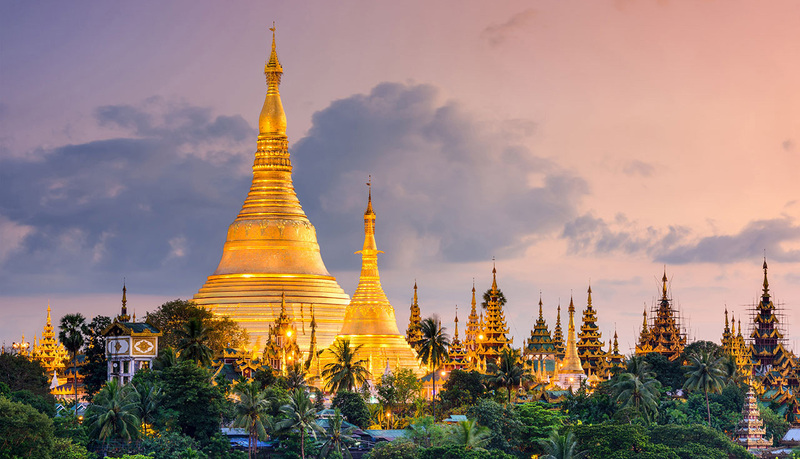 It takes only 25 minutes from the Shwedagon Pagoda to reach Kandawgyi Lake, the largest water reserve in Yangon created during the British time with its waters coming from Inle Lake. The lake is at the centre of a beautiful park. It has a couple of artificial islets as well as the Agriculture Museum. Kandawgyi Lake stands next to Yangon Zoological Gardens which includes an aquarium. A major attraction is the Karaweik Palace, a life-scale reproduced royal barge which contains conference halls and a restaurant. Go there: East of Shwedagon Pagoda, Kandawgyi Lake is north of the city centre and easily accessible by taxi. Open every day except Monday from 8 am to 5.30 pm, Bogyoke Aung San Market is a favourite hang-out for tourists with its colourful shops, many selling souvenirs, gemstones, handicrafts. There are also a few art galleries selling paintings of local artists as well as restaurants and coffee shops. The market was opened in 1926 with its architecture mixing by art deco and Moghul style details. A few meters away west of the market stands the splendid Holy Trinity Anglican Cathedral built in 1886 in neo-gothic style. 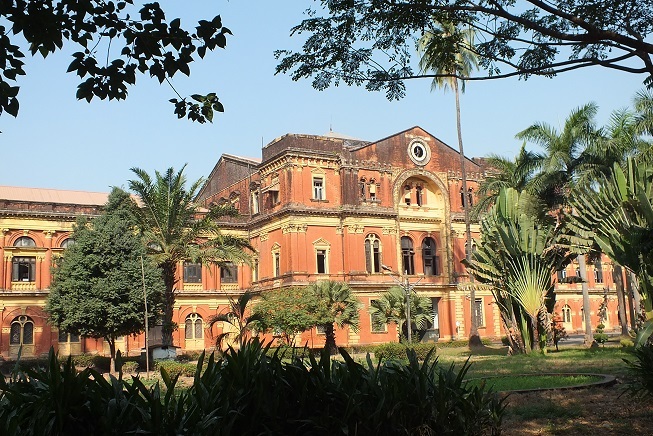 East of the market is the former Burmese Railways administration building built also in neo-gothic style. It is being turned into a five-star hotel due to open in 2020. Go there: The market stands in front of Phaya Lan Train Station, part of the extensive ring railroad serving Yangon. The large street is lined up with British style buildings with turrets, bow windows and columns and still active today with shops, hotels, and restaurants. 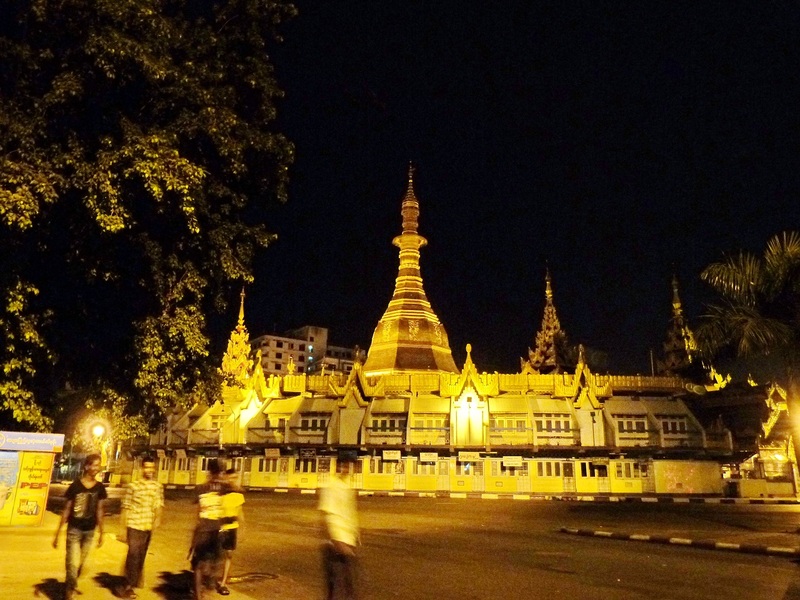 In the midst of the road is Sule Pagoda, deemed to be older than the Shwedagon Pagoda. The octagonal chedi which is 800 years old, the beautiful pagoda is 120 years old. Go there: Sule Pagoda Road is in the centre of town and easily accessible. The small park can be considered the centre of Yangon colonial administrative town. 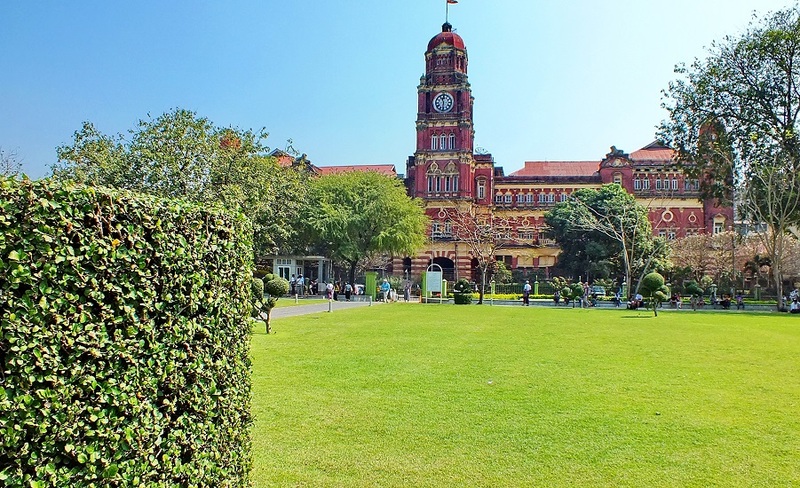 It is surrounded by superb colonial structures including Yangon City Hall built in an unusual mix of European and Burmese styles with its arches and tiered roofs. The city hall was built from 1926 to 1936. Opposite the city hall is the High Court built in typical British red bricks neo-renaissance style with its giant clock tower. The park has an obelisk commemorating the independence of the country and is an easy place to meet and chat with young locals. Go there: Bandula Gardens are in the middle of Yangon city centre. Running parallel to the Yangon River, the road was the first street developed by British after taking over Yangon and developed for trade and commerce. On the strand, commercial enterprises had indeed direct access to the River and the port. 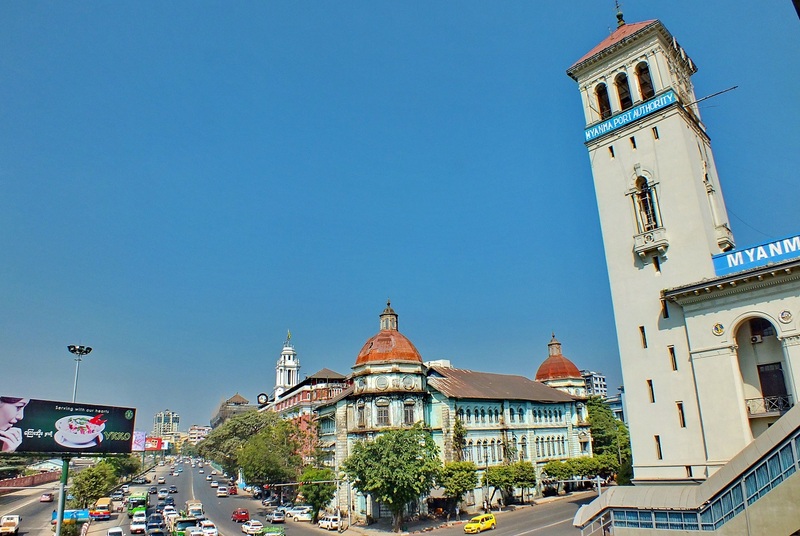 Over the years, the Strand became Yangon signature boulevard with its majestic Victorian and Edwardian structures. The street is lined up these days with many night markets with food outlets. Go there: In the city centre, the Strand can also be accessed by boat from the Pansodan Ferry Terminal along the Yangon River as well as by a suburban train. Along the Yangon River, the pagoda is visited by many Buddhists who come to worship a sacred hair and a tooth relic of Buddha. The inside of the pagoda is covered by gilded sculptures and bas-reliefs. Go there: East of the Strand, the pagoda is easily accessible by taxi and public transport or by ferry. The Yangon river is now welcoming many new cruises, which are particularly attractive at sunset as they offer concerts and dinner with a view over the old colonial town. 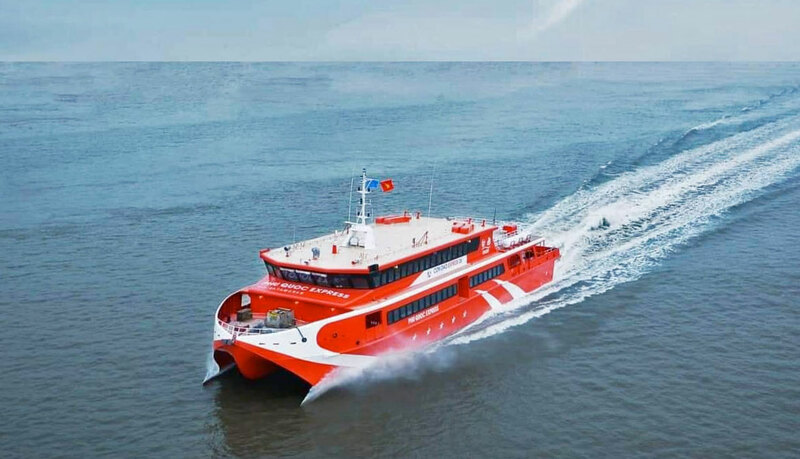 There are small ferries and an express ferry service that make the journey from Botahtaung to Insein. The trip takes between one and two hours depending on the boat service. The express service stops at five jetties – Botahtaung, Pansodan, Lanthit, Kyimyindaing, and Shwe Padauk – before reaching Insein. The most spectacular colonial structure of Yangon is getting slowly renovated to accommodate museums, art centres and eventually a hotel. It is a huge building in the centre of the old town which was built in neo-renaissance style from 1889 to 1905. It served as the administrative centre of British Burma and was then used by various ministries and administration before the transfer of the capital to Nay Pyi Daw. Part of the building is hosting a temporary exhibition as the structure is being restored. Go there: The Secretariat is located east of the city centre and easily accessible by public transport and taxis. Myanmar largest museum has been relocated into a new building in 1996 and host an extensive collection of arts and handicraft about all the ethnics present in the country. Sections of the museum cover Burmese Epigraphy and Calligraphy, rural life, jewelry, arts, music, and puppets as well as all ethnic cultures. The museum is opened every day except Monday from 9.30 am to 4.30 pm. Go there: The National Museum is located south of the Shwedagon Pagoda, a 25-minute walk from the pagoda. It faces Yangon Planetarium. The easiest way to get to Yangon is flying. There are regular domestic flights routes connecting Yangon with Mandalay, Naypyidaw, Bagan, Taunggyi, Myitkyina, Sittwe, Myeik and many other local destinations. From abroad, travellers can take international flights to Yangon from Bangkok, Chiang Mai and Mae Sot in Thailand, Hanoi and Ho Chi Minh in Vietnam, Kuala Lumpur in Malaysia and Singapore. Alternatively, you can book online bus tickets to get from other cities in Myanmar to Yangon. Baolau integrates domestic and international flights to Myanmar to service online ticket booking to Yangon in advance. Once the reservation is confirmed, customers will receive an electronic voucher that can be used to check-in and collect the physical ticket at the station of any departure point.